Wheels regrets visiting JURASSIC WORLD: FALLEN KINGDOM! When JURASSIC WORLD was released in 2015 to a decidedly mixed response and yet still managed to be a massive financial success, a lot of people were left saying, "hopefully the next one will be better". The series has all the potential in the world to be great. It relaunched itself with viable movie stars Chris Pratt (GUARDIANS OF THE GALAXY) and Bryce Dallas Howard (THE VILLAGE) while paying nostalgic homage to the original and all that would be needed, the next go around, was a director with a strong eye for visuals, a solid script, and some good ol’ creature mayhem. Sadly, JURASSIC WORLD: FALLEN KINGDOM was only able to meet one of these requirements in the hiring of director J.A. Bayona (THE ORPHANAGE). Bayona fills the runtime of the film with some truly breathtaking shots. In every other aspect, the film falls woefully short. 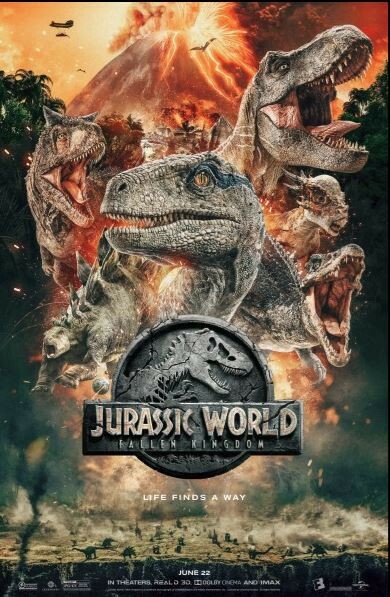 The story picks up three years after the events of JURASSIC WORLD and finds the dinosaur inhabitants of Isla Nublar facing extinction as a long-dormant volcano on the island has become active again. Most of the world is ready to write off the dinosaurs, seeing this as nature setting right the mistakes of mankind. 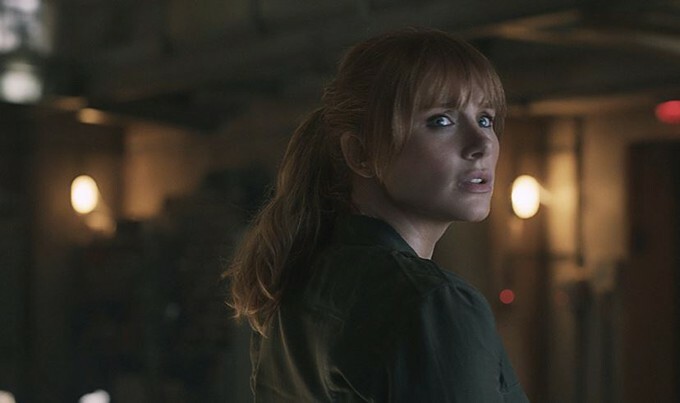 A group of environmental activists though, led by Claire Dearing (played by Howard), are working to save the dinosaurs from this fate. She is contacted by a representative of Benjamin Lockhart, played by James Cromwell (L.A. CONFIDENTIAL) in what may be a career-worst performance. 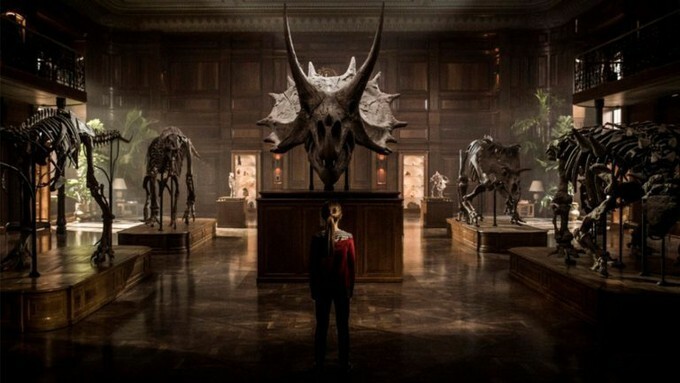 Lockhart, we are told, helped John Hammond with the scientific breakthrough that led to the cloning of dinosaurs. Lockhart's plan is to rescue eleven species from the island and take them to an isolated nature reserve. 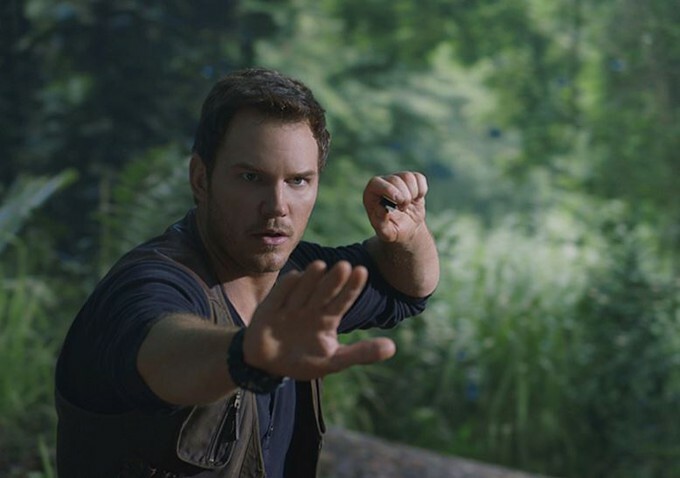 They convince Claire to recruit Owen Grady (played by Pratt) to go to the island with her and a team to try to capture "Blue", the last remaining one of the raptors Grady trained to obey commands. That synopsis covers just the set up for the first act of the film. The story spends barely any time on the Island before all the dinosaurs are captured and our protagonists are double-crossed and left for dead, leading them into a mission to save the creatures from being sold off for nefarious purposes. That's not a bad idea for a "Jurassic" film right? With a better script that concept might've returned a very entertaining movie. 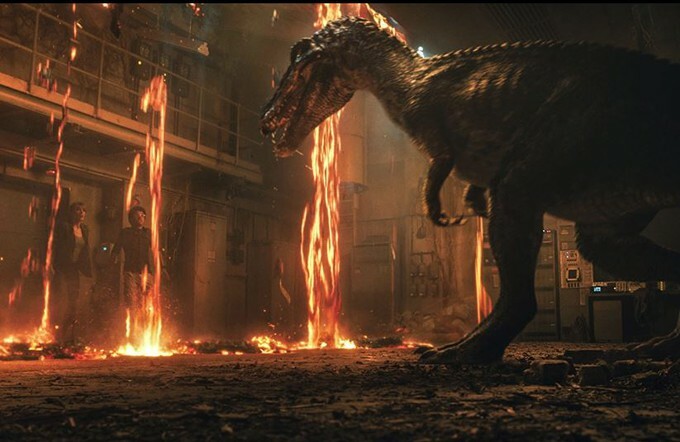 The script for JURASSIC WORLD: FALLEN KINGDOM, however, is disjointed, full of cliched dialogue, and characters acting in an aggressively stupid manner. Characters will perform actions that no rational person would attempt in similar situations just to keep the plot progressing forward. 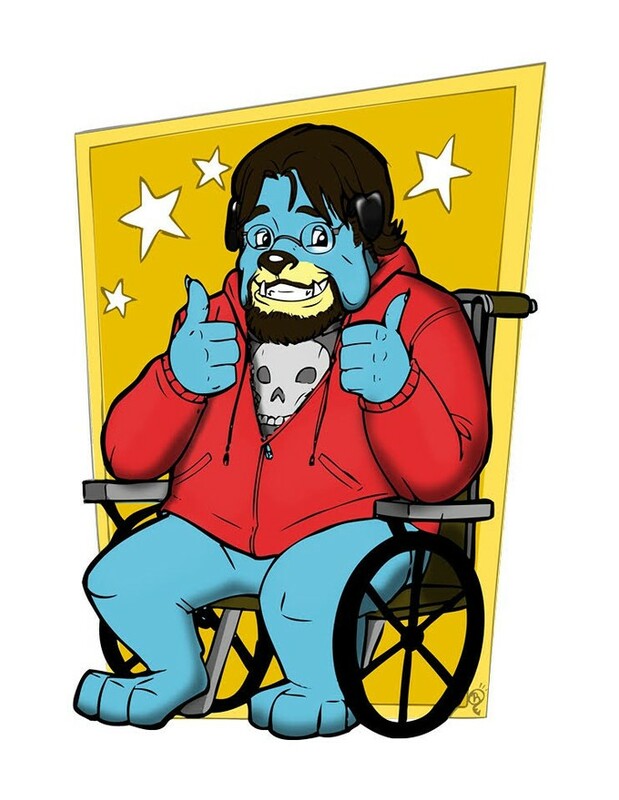 I understand that some suspension of disbelief is needed to enjoy any film but if you are repeatedly wondering why characters are behaving in such a way, while actually watching it, then the film is failing. The film even fails to provide exciting dinosaur action past the first act. Once the creatures leave the island they spend the majority of the film restrained, sedated. or locked away. The entire second act of the film is a slog to get through as it covers the transportation of the dinosaurs back to the mainland. We are left with just the characters to try to hold our attention during this section and the actors' charisma is not enough to overcome the poor dialogue and glacial pacing. With that being said at least that part of the film is not nonsensical, unlike the climax of the film where a genetic hybrid dinosaur, called the "Indorapter" (who apparently has the ability to grin and wink at the audience… I’m not joking) escapes during the auction and wreaks havoc. This section of the film has the dinosaur action but it is centered around a dinosaur that has barely been seen or even hinted at before the end of the second act chasing a character, Lockhart's granddaughter (played by newcomer Isabella Sermon) that up until the final 30 minutes of the film has no bearing on the story. She is basically a walking plot device that not only has one of the most undramatic character reveals I've ever seen in a major Hollywood release but is also the reason for the dumbest decision in a film chocked full of idiotic choices. As I said earlier, this film is aggressively stupid and it's perfectly personified by her actions at the climax of the film. As the film wraps up narration by Ian Malcolm, a briefly returning Jeff Goldblum (HIDEAWAY), plays over the final moments: welcoming us to "Jurassic World". Well, I think I'll be declining that welcome and any other offers to return to this series in the future. JURASSIC WORLD: FALLEN KINGDOM is playing now in theaters nationwide.